BALI, Indonesia -- An Indonesian court found an American couple guilty of premeditated murder and sentenced them to prison on Tuesday in the death of the woman's mother on the resort island of Bali. 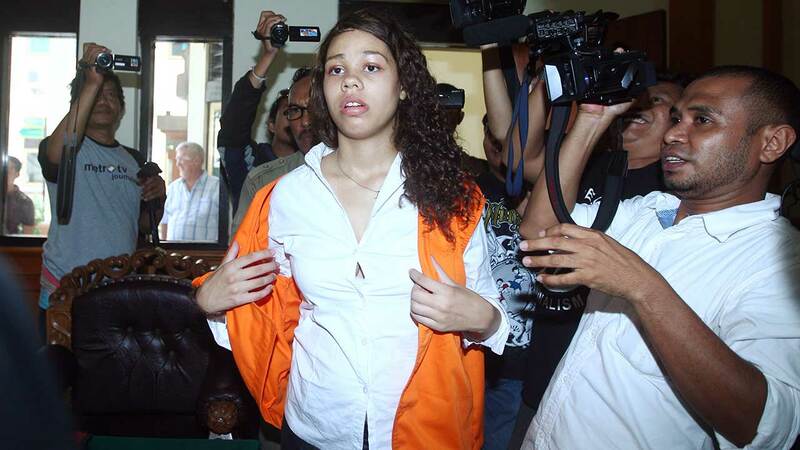 The Denpasar District Court sentenced Tommy Schaefer to 18 years in prison and Heather Mack to 10 years for intentionally killing Sheila von Wiese-Mack while vacationing last August. The body was found in a suitcase inside the trunk of a taxi at the St. Regis Bali Resort. The three-judge panel said it decided to be lenient toward Mack, 19, because she recently gave birth to a baby. The court ruled that Schaefer, 21, was guilty of battering von Wiese-Mack to death in a hotel room at the resort, and that his girlfriend Mack had helped with the Aug. 12 killing. Schaefer and Mack, both from Chicago, were tried separately in the same court with the same judges and prosecutors. They were arrested a day after the badly battered body of von Wiese-Mack, 62, was found in the suitcase. The charge of premeditated murder carries a maximum penalty of death. Prosecutors had sought an 18-year jail term for Schaefer and a 15-year term for Mack. Presiding Judge Made Suweda described Schaefer's deeds as sadistic, but said his politeness and an expression of remorse during the trial meant he did not receive a heavier sentence. Schaefer testified at his trial that von Wiese-Mack was angry when she learned about her daughter's pregnancy and tried to strangle him, prompting him to strike her with metal fruit bowl. Prosecutors said Mack helped Schaefer stuff her mother's body into the suitcase by sitting on it to enable Schaefer to close it. They then placed the suitcase in the trunk of a taxi outside the hotel and told the driver they were going to check out and would return, but never did, prosecutors said.